Right next to the hotel in a heritage-protected farmhouse is the 'Im Schnitzbiegel' wine bar serving traditional cuisine, including a number of Swabian specialities. Inside this restored, protected farmhouse there are four rooms, each offering a fantastic atmosphere. 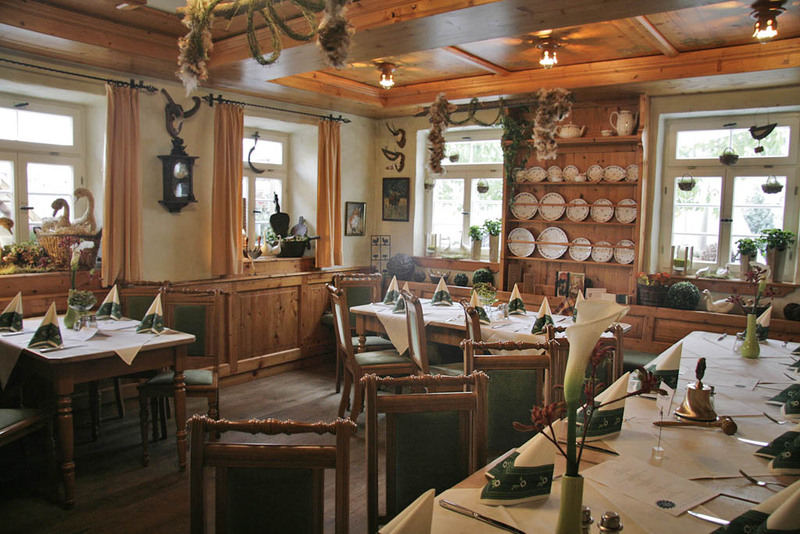 Look forward to the good Swabian cuisine in "The Schnitzbiegel"
With this picture gallery you can get a first impression of our wine bar and the beer garden "Im Schnitzbiegel"
Our oldest and most rustic room is full of dark wood and quaint charm. Formerly the sitting room of Wilhelmine 'Mina' Bürkle. d'Küch is right next to the 'Mina Stube' and offers seating around one large table. Light wood in a cosy country-house style. In the old days, the 'Gute Stube' was reserved exclusively for special occasions, such as Sunday lunch for the whole family. Named after the hunter Karl Bürkle who once owned half of the Schnitzbiegel.